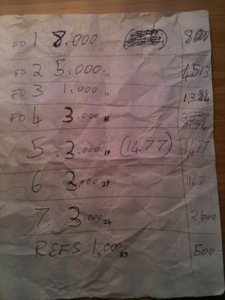 Last week I completed a very rough first draft of my next book. It’s now going to take me at least two or three months to edit it and shape it into its final form. I used the same approach that I used for my last book, which was to write the whole thing without doing any proof-reading or editing. This time I virtually worked through the chapters in order, with the exception of the conclusion which I wrote fairly early on. As a result, I’ve got a manuscript but it is very rough and will probably need a lot of careful editing work and some fleshing out in places. 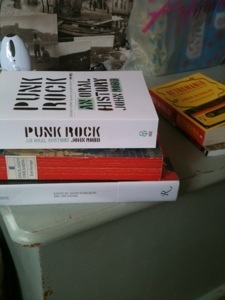 The book itself is called Punk Sociology and it is contracted for Palgrave Macmillan’s Palgrave Pivot series. These are short books that are published in print and e-book formats. My contract is for a book of a maximum of 30,000 words. I think the current version is around 28,000, so I’ve got a bit of space to work with. When I read about the pivot series I thought it was a great development. 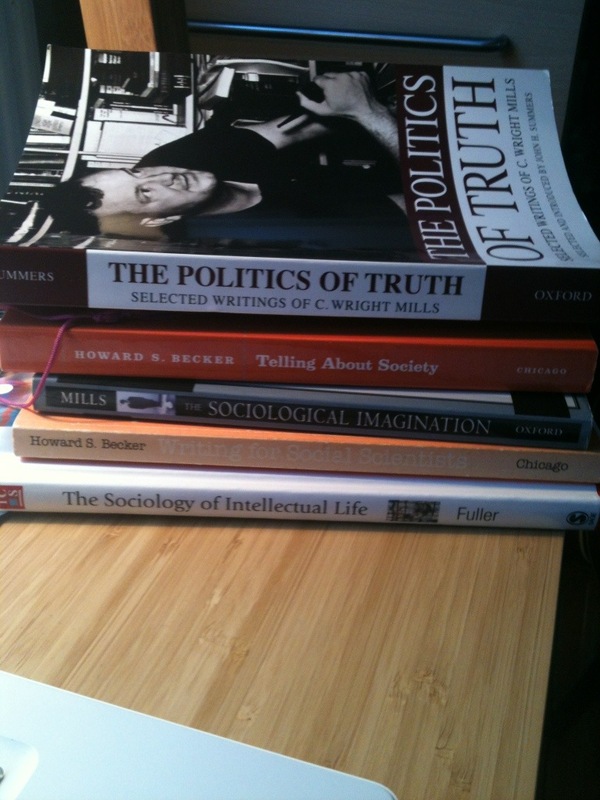 I’d had the idea about punk sociology many years ago, but I hadn’t intended to write about it. It was more of something i used myself to guide my work. When I finished my previous book I wanted to do something different, this new book format came together with the idea I already had. This convergence, along with some encouragement from trusted colleagues and from the publisher, motivated me to put a proposal together. The pivot series is intended for provocative interventions, and this is what I’m trying to do. I’ve tried to be provocative but with the aim of writing something that might contribute to debates on the future of sociology. As a result, I decided early on that I wasn’t really going to blog about the book until I’d developed the idea a bit more. So, this is really the first post on the book’s progress. The book itself develops an idea I’ve previously written on, which is that we can draw upon alternative forms of knowledge in order to develop the repertoire of sociology and the social sciences. This draws on work by Howard Becker and others. The book responds directly to a range of debates on the future of sociology (including those in the picture below, amongst others). I’ve tried to frame the book using these debates. I’ve found these contributions to future of the discipline to be really interesting, and i was keen to join in with my own intervention. These books and articles provide a disciplinary context for the book. I’ve also drawn on work on the contemporary university to give the book an institutional and structural backdrop. 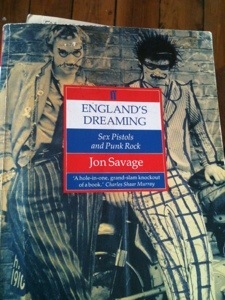 I wanted the book to open with a context to which punk sociology might be seen as a response. This is all set out in the opening chapter. I won’t rehearse the arguments here, but the book suggests that we can draw upon punk as a source of inspiration for thinking about the future of sociology. This is something I then develop through the chapters of the book. Imagine different aspects of sociological practice. In keeping with punk, it tries not to be too prescriptive, but I’m hoping there is enough in the book for fellow sociologists to respond to. I’ll post about the progress of the book over the coming months. The timescales will depend on how much work is required on the draft manuscript, and the other demands on my time. It’s been very enjoyable writing this book, so I don’t want to rush the final stages. I found it really productive returning to this old idea, I’m not sure I’d have done it if I hadn’t seen the pivot series. 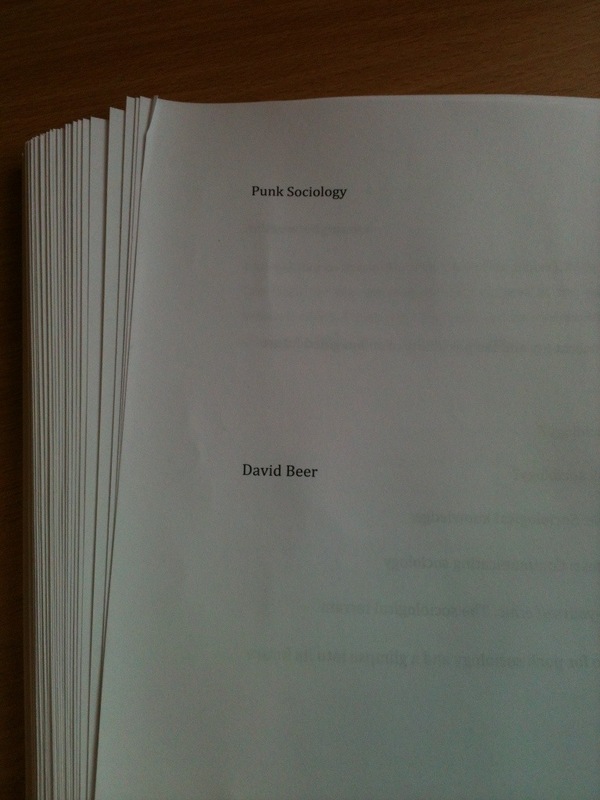 This entry was posted in future of sociology, history of sociology, music, university, writing and tagged book, draft, manuscript, next book, Punk sociology. Bookmark the permalink.